Internet mashup service IFTTT on Thursday announced the first three in a new series of "Do" apps —Do Button, Do Camera, and Do Note —designed to help users create quick on-demand workflows. Do Button, Do Camera, and Do Note. Do Button ties IFTTT recipes to a simple virtual button —users can tap the button to immediately perform the selected action, such as setting their Nest thermostat to 70 degrees or turning Philips Hue lights on or off. The app can define up to three buttons at a time, and an included "Today" widget allows quick access from the iOS Notification Center. Do Camera works much the same way, but with the added wrinkle of capturing images. Users could configure a Do Camera recipe to immediately post captured photos to Evernote for documenting receipts, or as a quick way to create new Tumblr posts. Building on the theme, Do Note employes a similar do-this-now mechanism, but for text. IFTTT imagines users sending new tweets in a single step, or quickly creating Google Calendar entries. 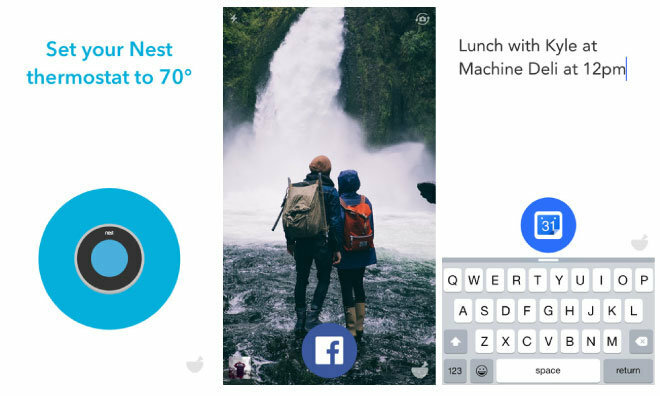 At the same time, IFTTT updated its flagship app with an all-new design and a new name —now, it is simply known as IF. IF version 2.3.1 is available now as a free, 22.4-megabyte download from the App Store. Do Button, Do Camera, and Do Note were still in the process of rolling out at press time.